"Former U.S. President George W. Bush, who led his country into a disastrous war with Iraq on the basis of concocted evidence of weapons of mass destruction and who authorized the use of torture against foreign prisoners of war in violation of the Geneva Conventions and international law, died today..."
No, George W. Bush did not die today. But, if he had, you can bet that would not be how the media would begin reports of his demise. So why does "brutal dictator," "murderous tyrant," etc., seem to be the required starting (and often only) point when the mainstream western media writes about the death of former Cuban leader Fidel Castro? Castro's body was still cooling when CNN announced his death, barely managing to say his name before taking it in vain: "Fidel Castro, the Cuban despot..." The New York Times couldn't get through its first paragraph without blaming the Cuban leader for "bringing the Cold War to the Western Hemisphere," and for "pushing the world to the brink of nuclear war" during the Cuban missile crisis. The Washington Post? "One of the most brutal dictators in modern history has just died." London's Sunday Times: "a murderous tyrant... a blinkered ideologue who slavishly followed Moscow down the road to penury, foreign adventurism and dictatorship." The Guardian: "a manipulative demagogue, an oppressor and a relentless persecutor of those who dared challenge his will..."
In Canada -- where we have had continuing diplomatic, commercial and human relations with Cuba and Cubans for nearly 70 years -- you might expect the Canadian media to know better. No better. With the reluctant, obligatory "communist Cuba did make progress on literacy and health..." Globe and Mail editorialists make the incredible argument that dictator-ruled, mob-controlled pre-Castro Cuba was "one of Latin America's richest and most developed countries" before Castro turned it into a "basket case." Which, of course, gave free reign to Globe columnist Margaret Wente: "Fidel Castro was a failure in every way. He wouldn't give his people freedom and he couldn't even give them bread. We should be dancing on his grave." One can only wish Wente would begin to plagiarize from more reputable sources. Though not, in this instance, from the CBC. While covering what appeared to be -- on the TV screen of it -- massive crowds "flooding" into Revolution Square to pay tribute to their late former leader, CBC reporters did their best to create a counter narrative: some had been bussed in, forced to pay tribute to their "repressive" leader. "While many are criticizing the legacy of their former president," declared CBC newsreader David Common (report begins at 4:36), "it's difficult to find dissenting voices in Havana." In fact, Adrienne Arsenault -- normally a diligent reporter -- couldn't find a single one. So she Skyped with an "often-arrested, outspoken artist" who happened to be "out of the country," but who nonetheless declared: "I know for sure that repression is going very strong these days..."
And so it has gone. 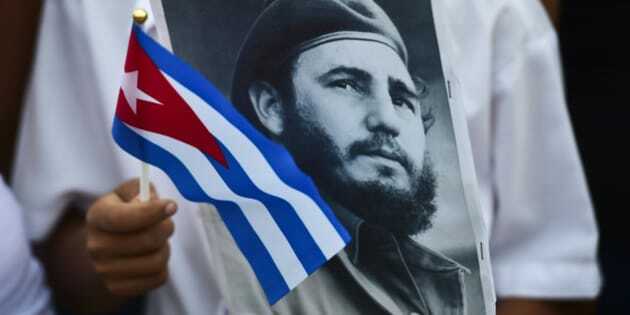 The media is one great echo chamber of conventional American mass media un-wisdom: about Castro, his life, his death, his legacy; about Cuba's past, its present, its future. What did the media miss about Fidel Castro's nearly six decades in power? Let's start with six of Castro's signature humanitarian achievements. The National Literacy Campaign. In 1961, in what Oxfam described as "one of the most successful initiatives of its kind, [Castro] mobilized teachers, workers, and secondary school students to teach more than 700,000 persons how to read." By 1962 -- just three years after the revolution -- Cuba's literacy rate was 96 per cent, one of the highest in the world. Since then, Cuba has dispatched literacy volunteers to other under-developed countries to improve their literacy. Cuba has a higher literacy rate than Canada. Cuban public health care is the best in the developing world. Cuba has 90,000 physicians, more than we do in Canada. On a per capita basis they have three times more than we do. The infant mortality rate is lower than it is in Canada, and life expectancy is about the same. Cuba also produces 70 per cent of its own medicines, and so the prices are a fraction of what we pay. Cuban Medical Internationalism. Today, there are 55,000 Cuban medical personnel in 67 different countries, responding to every kind of natural disaster and health crisis -- from earthquakes to Ebola. That is more than is provided by all G-7 "developed" countries. At home, Cuba provided free long-term care for 26,000 victims of the Chernobyl disaster, mainly children. The Latin American School of Medicine. Originally established in 1999 to educate students from poor countries to become doctors, UN Secretary General Ban Ki-Moon has called it "the most advanced medical school in the world." A Fidel Castro initiative following the destruction wrought on the region by Hurricanes Mitch and Georges, ELAM has graduated more than 25,000 doctors from 120 countries. Students' education is totally free; their only obligation is to return to their own countries and practise in under-served communities. Operación Milagro, a program spearheaded by Cuba and Venezuela that has provided free medical treatment to more than three million people with eye problems in Latin America, the Caribbean, Asia and Africa since 2004. The struggle against apartheid. Although more controversial than Cuba's achievements in education and health care, Castro's decision to send troops to Angola in support of independence movements during wars of independence there in the 1970s and 1980s is widely seen as the beginning of the end of apartheid. By defeating the South African army, writes historian Piero Gleijeses, "Cuba changed the course of history in southern Africa." Or, as Nelson Mandela himself put it: "What other country can point to a record of greater selflessness than Cuba has displayed in its relations to Africa?" None of this is to suggest Fidel Castro was a saint, nor that Cuba is a paradise. Far from it. When it comes to individual human rights and press freedoms, for example, Castro's record is less than stellar. We can explain it -- start with the more than $1 billion the United States government spent trying to assassinate Castro and foment a Cuban counter-revolution, and you begin to understand why the Cuban government might doubt dissidents' sincerity -- but we shouldn't excuse it, or ignore it. History may indeed absolve Fidel Castro; we shouldn't so easily excuse the media's abysmally one-sided, post-passing portrayal of him.